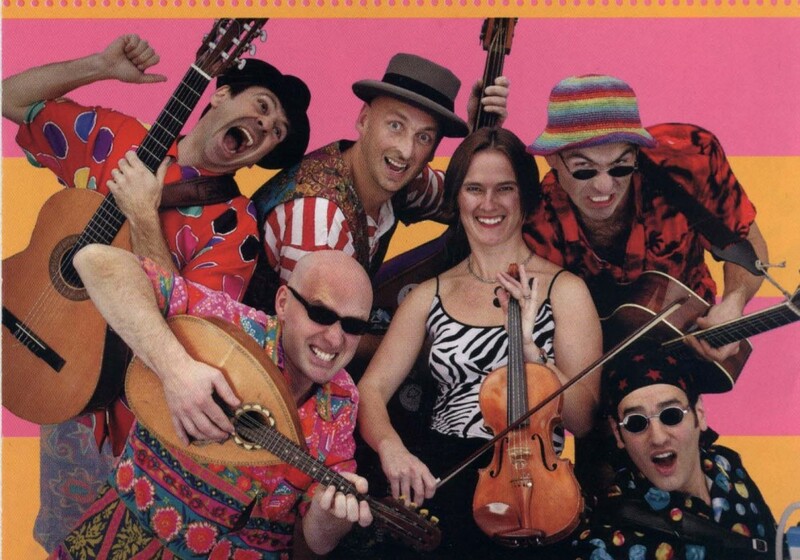 A six piece party band comprising violin, double bass, accordion, mandolin, guitar and harmonica. With a repertoire of over 70 songs, melodies and theme tunes, they give unusual and hilarious twists and treatments to well-known songs. 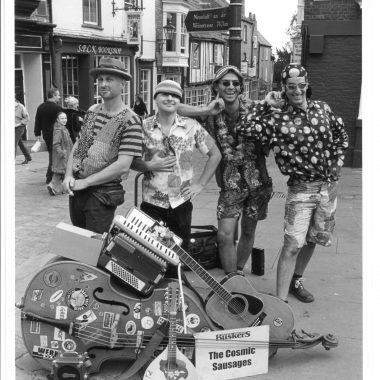 The Cosmic Sausages were formed in 1990 and developed their show during an epic 5-month European tour taking in 12 countries and performing their streetshows over 250 times. 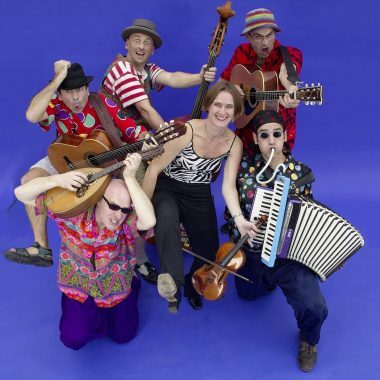 Since then they have returned to Europe frequently, appearing at numerous Street Theatre and Music Festivals in places such as Ferrara, Neuchatel, Bern, Castellaro and Davos, as well as winter tours of the ski resorts including Chamonix, St Mouritz, Lenzeheide, Val d’Isere and Chateau D’oex. Back home in England, the Sausages perform extensively up and down the land. 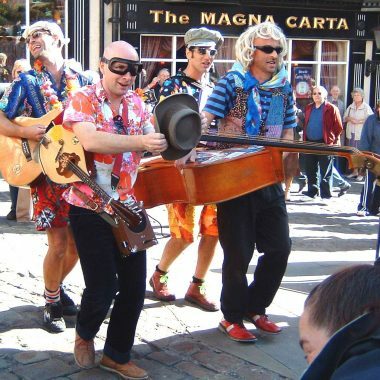 Appearing regularly at many festivals such as Glastonbury they have also found themselves imbedded in local folklore in many towns (such as Bath) where they have become street performance legends! 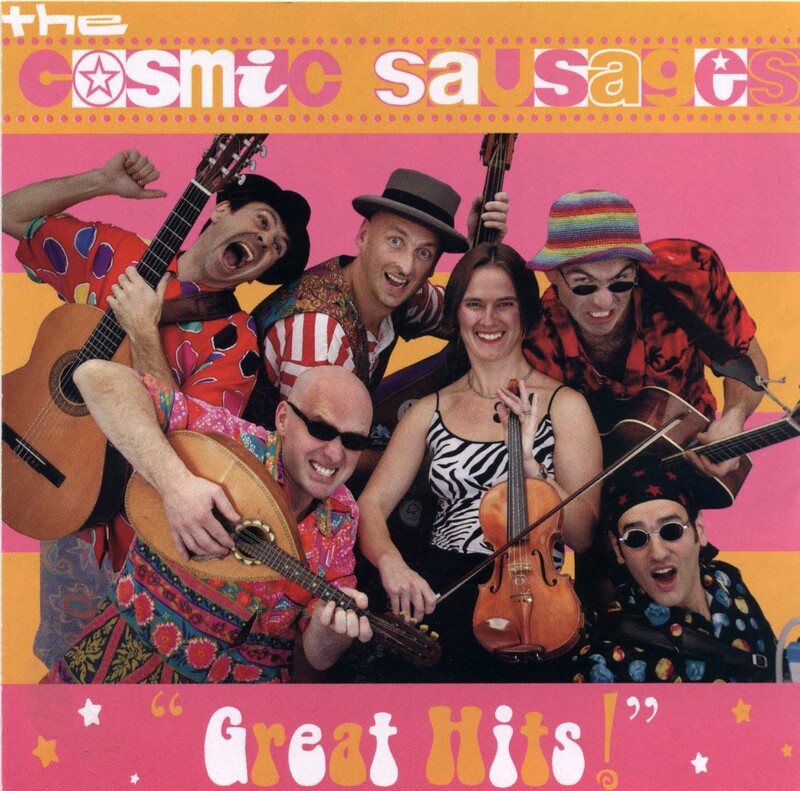 The Sausages have played hundreds of weddings and parties and performed at corporate events for some of the country’s largest companies. 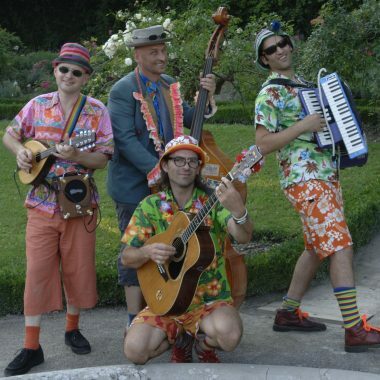 They have played in a wide variety of locations from the large (Earls Court and Knebworth) to the small (Garden Fetes a speciality). They have performed at the National Theatre and appeared in Pantomime at ‘Circus Crimbo’ at Blackheath Concert Halls 1999/2000. They have performed live on Pick of the Fringe on HTV and are heavily featured in the Music Mavericks documentary by Swiss Art-House Film Director Alain Godet. Other television appearances include ‘Newsround’ and a live appearance during ‘National Music Day’ (BBC1).